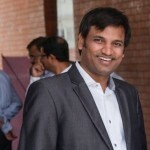 Atul Gupta – Founder and CEO of Insync Tech-Fin Solutions started in Kolkata as a single Founder. Atul’s first employee was someone who he had worked with for 3 years before he started out and was hence a part of the founding team. They started as an IT Services company and took up any and every assignment they thought they can either execute or learn to execute. After doing IT services for 4 years, they had done a number of projects which could be repeated. Since the ‘services’ business was homogeneous in nature, they aligned with a Tier 1 SMB ERP and became their Sales and Implementation partner. That brand got them the meetings and the conversations with a few prospects. Insync was either selling the ERP and cross selling the services or were using the ERP as a foot in the door and selling the services. Atul recalls one day when a customer accepted to buy the ERP product only on the condition that he gets a commitment from them on the integration of the ERP with the client’s e-Commerce platform as part of their deliverable. He deployed a developer to develop this integration and went live. The customer was very impressed. This was when Insync realised that this was a need resonating with many other early customers who spoke about the same requirements. It was basically the same product idea. However, no one was as forceful as this customer and they realized the potential only then. Atul understood that there was a huge potential for a repeat sale of this integration product. He also realized that this is a killer software product that is being built with the potential to solve a specific niche challenge or problem. Many businesses are rapidly adopting multiple products with each application being independent but Atul realized that soon these applications would have to talk to each other. The two of them made a video of the developed product and published it on Vimeo. Since the ERP product was a global product, they knew that this product would have a global appeal. This got a couple of people interested and they wanted to take a closer look at the product to get a deeper understanding. They gave a couple of demos and took the initial feedback. Some customers were negative about the idea that they would need B2B functionality for the ecommerce side to be useful and hence did not want to buy. However, some customers were happy with what they had to offer and thus they got their first few customers. They built and launched their first product website, did a lot of digital marketing and started to get enquiries on the product. After the video marketing got some leads, they approached all the partners of SAP B1 and showed it to them. With the successful customer implementation, it was easy to sell to the channel. They also opened a LinkedIN group – SAP B1 Add-on and also grew the group to around 3000 active users within a year. These activities got them the initial traction. The sales cycle was typically for 1.5 months and initially all the large deals involved a lot of customisation to what they were offering. They were willing to pick up the deals in their product space at any cost and did whatever the customers were looking for. There were many people who said that they were using SAP B1 and Magento and no one was there to provide this solution and there was one customer implementation that they could showcase and then sold it without much trouble. They also built the B2B component soon and went back to the people who rejected them because of this missing component. The most important selling point was a running software and the willingness to customize to any extent to make the product work within the customer’s environment. Atul recalls the first demo where the prospect gave them lots of interesting feedback. Then they bumped into some customers who did not know anything in this space and they got through. The second customer was Planetjill which required a lot of customization. There they had to go through multiple meetings to convince them that they would be able to develop. The site had custom jewellery that was being sold where the user could use a crop tool to give an idea to the user on how these will look like. This cropped photo needed to be sent to the SAP system for it to take it to production. Since this was a custom tool implemented in Magento, pulling it into SAP was difficult and the customer had to do it manually. Atul and team worked on it and made it automatic. The first 3 years they focused only in one small segment (SAP B1) but they did not realize that this was a need that the other ERP products also needed. They had not ported the product to other ERPs. Atul and his partner later realized the potential they had missed and so they rebranded the product and went after the other ERPs which cost them time and money. Atul feels that he should have catered to a larger market as they grew. He asks entrepreneurs to focus on a narrow segment but market for a larger TAM by keeping a generic name for the brand if need be. One has to focus on a niche as one cannot do too many different things as a start up. Build something which the global market can use. Even the small Indian customers are difficult to sell software to as the sales cycle resembles large enterprise sales. However, the global market is much more open to buying software and hence, move out as fast as you can. InSync has 45 employees, over 450 customers and over 100 partners. The product got showcased in NASSCOM Launchpad and NPC Product showcase 2014. They also won the 1M pitch and a few other pitch fests. They are bootstrapped.